Horse Barns & Step Down Barns for SaleMetal is the most trusted material when it comes to building barns for your horses and livestock. 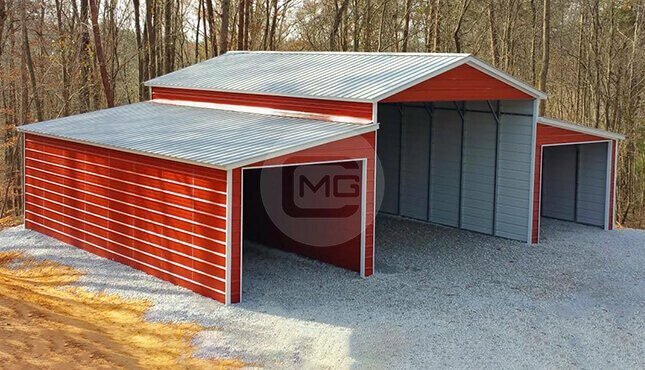 Metal Garage Central can also include a large front overhang on your metal barn, giving your horses a sheltered place to stand outside and also ensuring that their stalls will stay dry. No matter how many horses you have, this design provides plenty of room for every horse to be comfortable in their space. 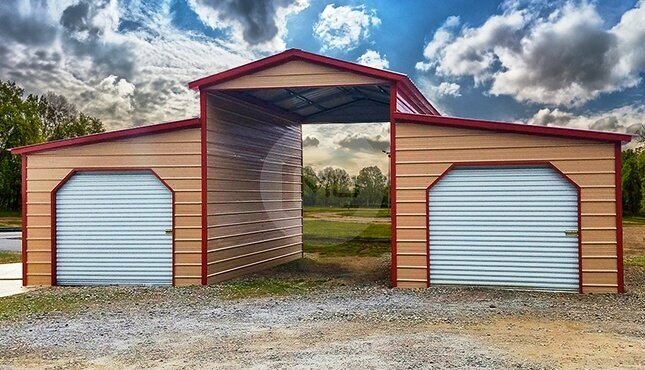 We can also customize your steel horse barn by adding additional storage room at one or both ends. The word “barn” tends to bring up an image of an old, red, wooden building in some stage of disrepair, out in a field somewhere. But thanks to modern technology and building materials, Metal Garage Central can custom design a metal barn for you that is much more functional and longer-lasting! Our structures are extremely rugged and versatile, and are fully customizable according to your needs and preferences. You can also choose from different roof styles and from many different color options. 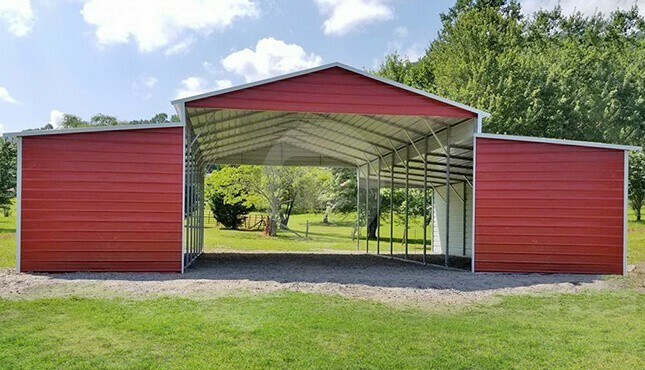 These precision-engineered steel structures are known for their strength, durability, & cost-effectiveness as compared to barns made with wood or other materials. 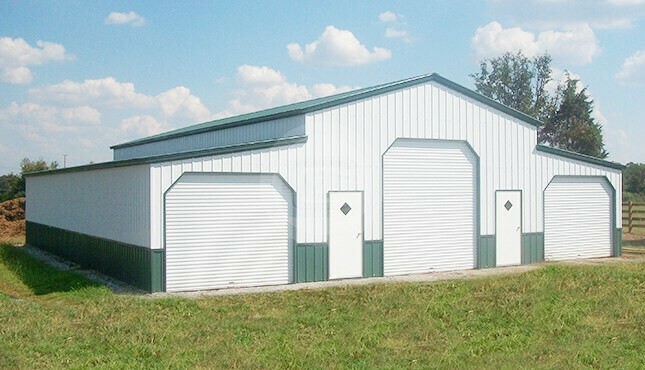 One of the first things you need to decide when choosing a metal barn is how you plan to use your building. You’ll want to consider how much space you’ll need to be able to accommodate your animals and supplies, or anything else you’d like to keep under cover. It’s also wise to allow for extra space to include future additions. 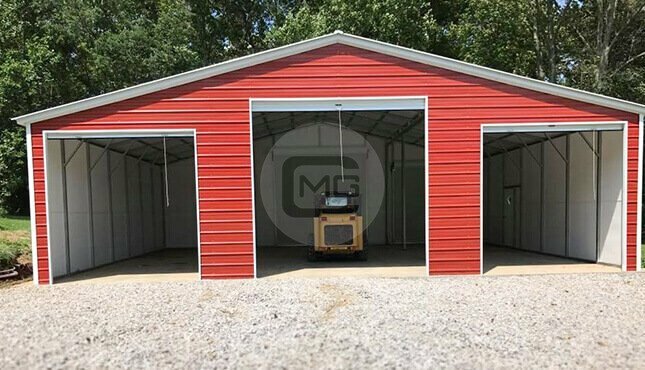 Prefab steel barns are available at Metal Garage Central in any custom size to fit your needs. 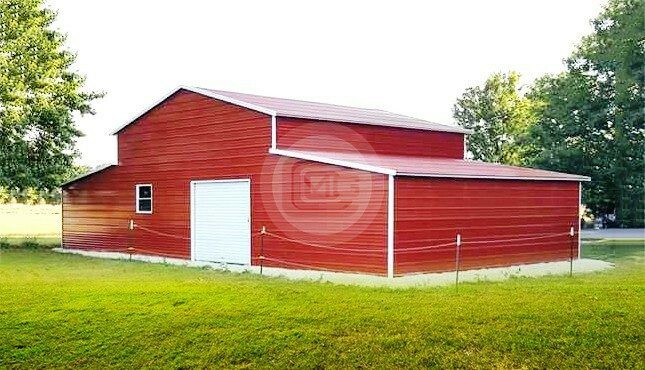 We can build any size metal barn or facility, from a small horse barn to a building large enough to store a combine harvester! Not sure what size barn you need? Not a problem! Just reach out to one of our friendly and knowledgeable building specialists, we’ll be happy to listen to how you want to use your building, and then we can suggest some design options that will be sure to meet your needs AND your budget! The roof style you choose for your custom steel barn makes a big difference in its functionality, and roof style also has a significant impact on the final price tag. It’s important to consider the typical weather in your area when choosing a roof for your metal barn. If you live in an area that experiences heavy rain or snowfall, it is recommended that you go with a vertical roof style barn. The boxed eave roof style has a peak like the vertical style, except the panels are installed horizontally. For this reason, we recommend purchasing a boxed eave roof style barn if you live in an area that doesn't experience a lot of snow or heavy rainfall. At Metal Garage Central, our prices are among the most competitive in the engineered steel structures industry. 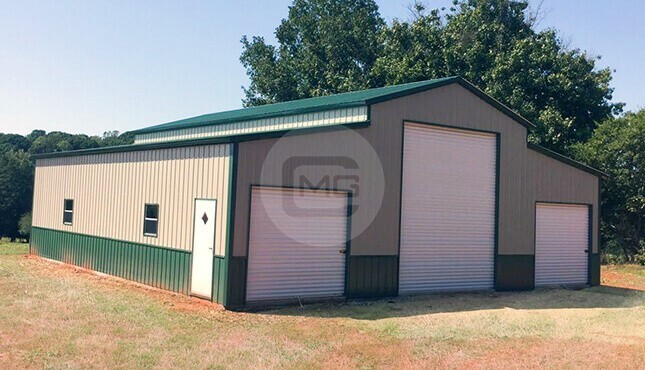 Pre-engineered metal barn prices will vary based on the extent of customization involved (roof style and dimensions), any additional materials desired (siding, gables, doors, windows, etc. ), the gauge of frame (standard 14-GA or sturdier 12-GA), the gauge of sheet metal (standard 29-GA or sturdier 26-GA), and the certification or building permit requirements of your region. 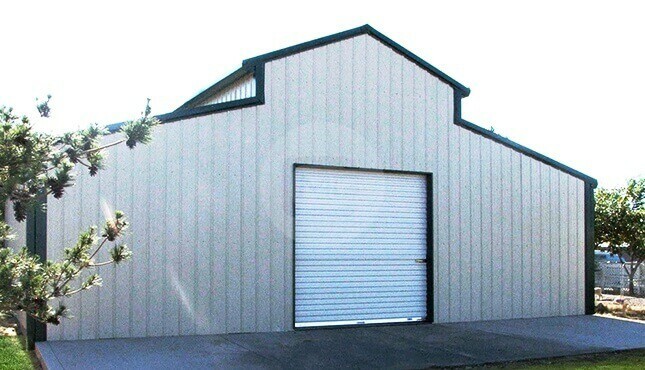 The state in which you install your new custom metal barn will also affect pricing. If you’re looking for accurate, up-to-date metal barn prices, look no further than Metal Garage Central! We keep our website current with real-time barn pricing updates. And of course, you’re always welcome to give one of our building specialists a call and we can answer all your questions on the phone. 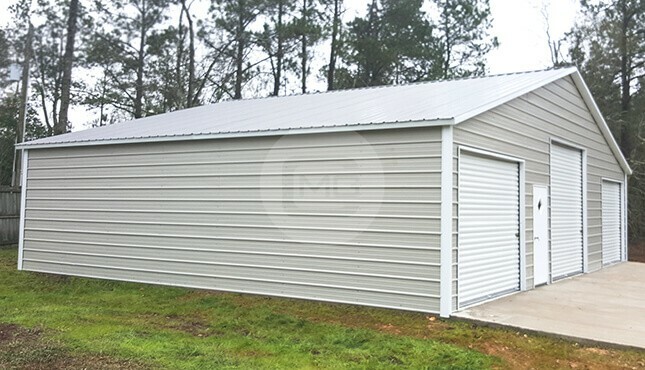 Oh, and here’s one feature you won’t have to worry about paying for – all of our steel barns come with FREE delivery and installation with purchase! Depending on your location, we have up to 18 colors you can choose from for your roof and wall paneling. With all the possible color combinations, we’re sure to be able to help you design an attractive barn that will blend in nicely with your other surrounding structures. At Metal Garage Central, you also have the ability to design your own custom building from the comfort of your couch with our state-of-the-art online 3D Building Designer. With our 3D Building Designer you can create a design, save it for future reference, share it to your email or social media, and even process your own custom order! Check it out for yourself, and start playing with the possibilities today! Our friendly, knowledgeable building specialists are here to help! We’re happy to walk you through the whole process, from design to ordering to production to installation. 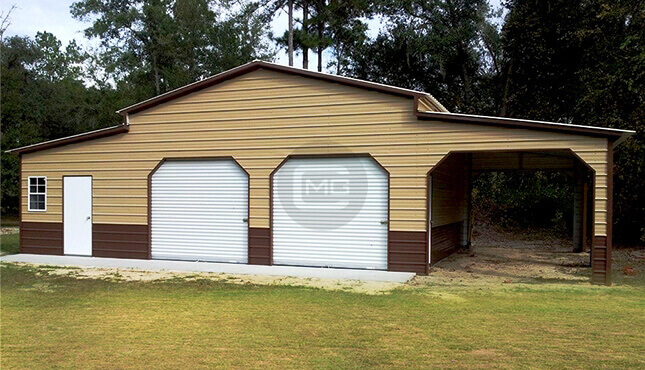 Check us out online at Metal Garage Central, or give us a call at +1 (980) 949-0615 and let’s get started on designing the metal barn of your dreams today!